I can't believe summer is finally here let alone the Fourth of July is right around the corner. Ordinarily, I remember summer being chalk full of parties and get-togethers before I became a constant mover and am never in one spot for very long to meet others. One thing I do know is that I love planning parties and with the month of July, I have three different birthdays to plan for. Party invitations are one of my favorite parts of planning a get-together and one place I turn to is Tiny Prints. 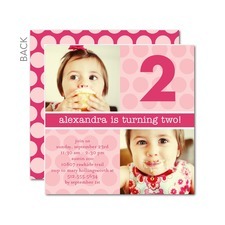 I have ordered invitations and stickers in the past from TinyPrints and have always loved the quality. In fact, I just used some for my daughter's non-profit on a delivery we made to a local children's hospital. 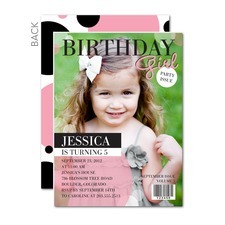 They carry something for everyone whether it's a party, a special occasion or an every day event. They even carry gifts and photo books and a great collection for those expecting a baby. One reader will receive 25 invitations from Tiny Prints. *Disclosure: I will receive 25 invitations from Tiny Prints for this post. The information and giveaway was provided by Tiny Prints. The opinions are of my own. love the mailed montage, fondestflow chart, chic calendar,distressed frame, chalk frame,umbrella collage, charming teacups,and many more! I just got engaged so these invitations would be perfect whether it's a save the dates, bridal shower, or wedding invitations! Thank you for giving me the opportunity to enter this giveaway, so sweet of you! Good luck to everyone who enters this giveaway! I love the Clear Sighted Party invitations! I could use them for this party I holding at the end of summer as a start-up for my art show! Fingers crossed I win, I could really use these- but good luck to everyone! I like the Charming Chalk adult birthday party invitations. I love the Playful Squares: Sky invitation! I like the Picnic Thieves invitation! I really like the "Her Dress" bridal shower invites. : Medium Pink 1st Birthday in Pink! Thank you! i like the fancy flowers.